Wire whip, burnished flat beater, spiral dough hook. Measurements H: 16.5, W:11.3, D:14.6. ATTENTION ALL CUSTOMERS: ALL ELECTRONIC ITEMS ARE 110V. 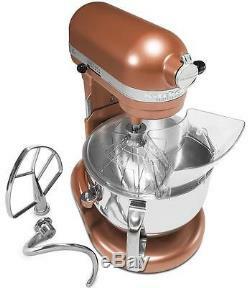 The item "New KitchenAid KP26M1XCE Pro Copper PL 600 Stand Mixer 6 Quart Stand Mixer" is in sale since Tuesday, March 8, 2016.